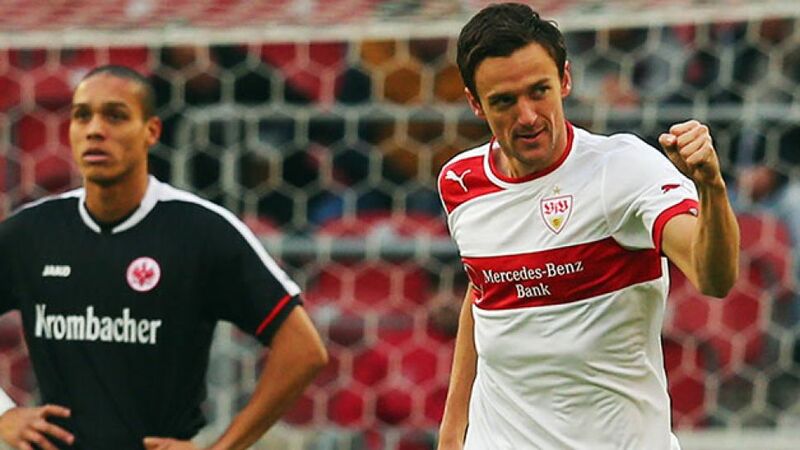 Munich - After being knocked out of the UEFA Europa League, VfB Stuttgart will be looking to get their Bundesliga campaign back on track when they travel to Eintracht Frankfurt on Sunday (kick-off 15:30). Despite having 28 attempts on goal against S.S. Lazio, the Swabians only scored once and will be keen to improve on thier meagre conversion rate against Frankfurt, who haven't scored in thier last five league encounters. “Their first two shots went in, and that was it,” said Christian Gentner. “It’s now vital that we get the points in Frankfurt, no matter how,” With Vedad Ibisevic and Martin Harnik both currently struggling for form, and Manchester United FC loannee Federico Macheda still trying to adapt to life in the Bundesliga, Stuttgart coach Bruno Labbadia could have done without the club’s medical department announcing on Friday that Cacau and Daniel Didavi have both suffered setbacks in their respective recoveries. Both are unlikely to make a return this season, leaving their team mates to try and revive the prospect of them playing in Europe again next season. “It looks like the DFB Cup will be the ideal way to do that,” said captain Serdar Tasci. Stuttgart face SC Freiburg in the semi-finals on April 17, but until then, there is plenty of ground to be made up in the Bundesliga. “In view of our league predicament, then of course we need points,” said sporting director Fredi Bobic, whose side have only collected four points since the winter break. “I was not too chuffed about the way we played in Rome and now I expect the team to pull themselves together and reward themselves for their efforts. It’s up to us now.” Certainly the glory days of 2007 appear more distant than six years ago, and they will get a poignant reminder of their last Bundesliga title triumph at the Commerzbank-Arena. Frankfurt coach Armin Veh was the man who led the Swabians to that third Bundesliga title, and it is he who will be plotting their downfall on Sunday. “It’s going to be very important for us to win at home again because we want to stick up there,” he said. Frankfurt lost fourth place for only the second time this season last weekend with Schalke 04 edging ahead on goal difference. European football next season remains a likelihood, though. “Why shouldn’t I be playing in Europe next season with Eintracht?” asked midfielder Sebastian Rode, who returns to the Frankfurt team this weekend after suspension. “He (Veh) has forged a super team and he knows how to get the best out of us.” Rode is set to take his place alongside Takashi Inui in the Frankfurt midfield with top goalscorer Alexander Meier hoping to end a drought which has endured seven matches. Frankfurt can also count on some extra support from Down Under with Formula One driver Sebastian Vettel keen to catch up with his favourite club's fortunes after what he hopes will be a successful season opener in Melbourne.